Welcome to the Aquatic Turtle Health Care superstore! Keeping your turtle's health maintained is a relatively simple process, but we're still here to help you every step of the way. Maintaining your turtle's clean and healthy habitat is the crucial first step to preventing disease and facilitating your turtle's long-term health. Turtle eye drops are useful in preventing and treating the development of eye infections, inflammation, and other eye problems. And for everything else, our turtle health aids are here to treat developing bacterial infections, repair wounds and heal damage. Pet Mountain's Aquatic Turtle Health Care store features top quality products from the most trusted names in aquatic turtle care and treatment, including Hagen Nutrafin, Zoo Med, and API. 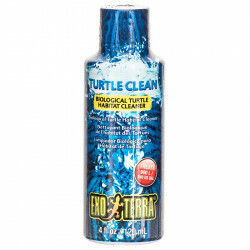 Nutrafin Turtle Clean Biological Turtle Habitat Cleaner helps eliminate organic waste in turtle habitats (such as terrariums, aquariums and bowls). Efficiently reduces solid turtle waste and leftovers from overfeeding. Use Hagen Turtle Clean to complement existing filters and reduce odors associated with decaying waste. 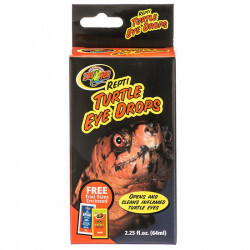 Zoo Med Repti Turtle Eye Drops opens and cleans inflamed turtle eyes. Use as a preventative for eye diseases caused by Vitamin A deficiency. Especially helpful with Box Turtle eye problems. 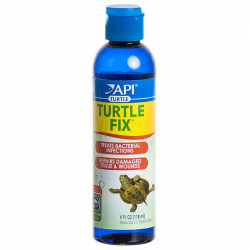 API Turtle Fix treats common bacterial infections, damaged tissue and open wounds in aquatic turtles, reptiles, and amphibians. Add it to your tank to rapidly heal damaged skin, limbs and tissue and keep your pets healthy and clean.